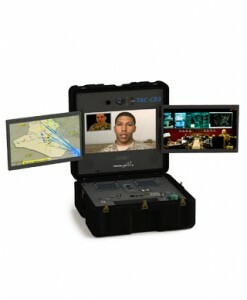 The TAC-CR3 is the world’s only Tactical Command and Control Center (NOC). Host and stream live video, data and multipoint video conferences. Automatically record video calls, tactical data, live streams, or video from internal or remote cameras. Automatically uploads and deletes recorded communications for remote command operations. Receive remote content live or On-Demand (VOD) – All Wireless, High Definition, Encrypted and Secure.